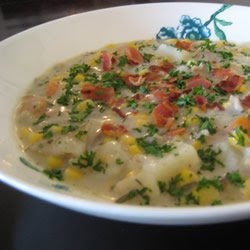 Even though its technically spring, its going to be cold and rainy weekend here in New York: perfect chowder weather! 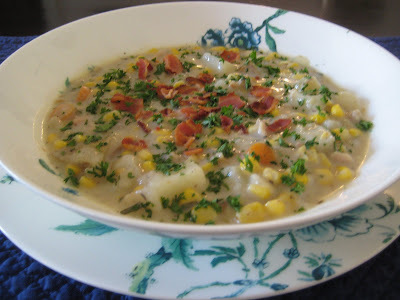 I adapted this recipe from a recent Bon Appetit article about eating better for less, but last I checked this chowder doesn’t seem to have ever made it on to Epicurious. Which is a darn shame because its economical, quick, easy, tasty, and a great way for Lovely But Unemployed Husband to get his bacon (“Mmmm, bacon”) fix without me worrying about the state of his arteries. (I am sparing you here from a truly dreadful joke about bringing home the bacon. I would like this noted on my permanent record. Thank you.) The original recipe called for whole milk, but I’ve substituted 2% because it’s a little less heavy and for us its more economical as 2% is what we use on a daily basis. Go ahead and use whichever you have on hand, or a mix if you feel like it. Like most soups, this freezes well. Cut bacon crosswise into ½ inch pieces. Peel and chop carrots, chop onions. Chop, but do not peel, the potato into ½ inch cubes. Cook bacon in soup pot over medium heat until crisp. Transfer bacon to a plate lined with paper towels to drain. 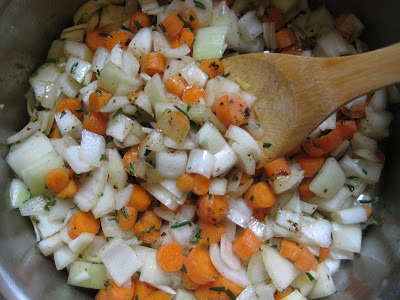 Add onion, carrots, thyme, rosemary, a few pinches salt and several grinds of pepper. Saute until vegetables are tender but still crisp (approx. 5 minutes). Sprinkle in flour, stir over heat until well combined (approx. 1-2 minutes). Stirring constantly, slowly pour milk into pot. Bring to a boil then reduce heat to medium. Cook until slightly thickened, stirring frequently (approx. 5 minutes). Add the clams with their juice, and the corn Return to a boil, then reduce heat to medium low and let simmet for another 10 minutes. Adjust seasoning to taste. Crumble bacon slices into bits. Sprinkle individual bowls with bacon and parsley, serve and enjoy! *Bacon freezes well and according to Sarah Moulton stays tasty for up to a month. Insert a sheet of wax paper between every six slices or so (or whatever the smallest quantity you think you might want at one time is), wrap in plastic wrap, and place in heavy duty freezer bag before freezing. ** The original recipe called for 1 8 ¾ oz can corn kernels, drained. “CANNED CORN?! ?” you ask, increduously. Hand to heart, Bon Appetit said to use canned vegetables. We elected to use frozen corn instead as, among other things, canned corn frequently contains added salt or sugars. I'm drooling just reading this. I'm away from my kitchen at the moment, but I can't wait to get home and try it out! This was very good - I made it earlier in the week and am enjoying it! Glad you like it! It's one of LBUH's favorites.